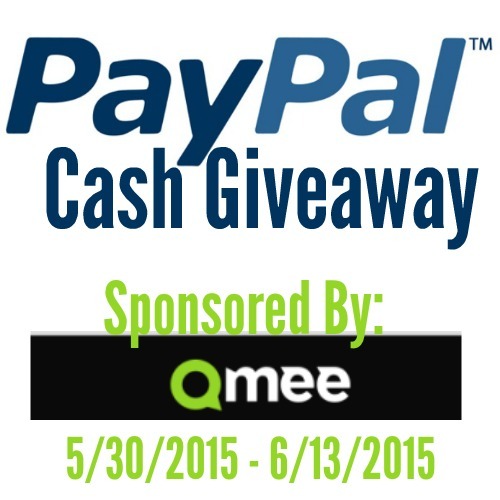 I’m so excited that Qmee is going to be sponsoring a PayPal Cash Giveaway and give our readers a chance to win some cash! Qmee allows you to earn cash by searching on your typical browser and cashing out any amount to your PayPal account. If you want to learn more about what Qmee is, you can read Living Frugal with Erika’s post about it today! Perfect prizes for anytime! Cash always works to get readers attention! Enter anywhere in the world and good luck to all! This giveaway is going to have three winners. One winner will get $40 PayPal Cash, one winner is going to get $30 PayPal Cash, and one winner is going to get $25 PayPal Cash! This giveaway starts 5/30/2015 at 12:00 AM CST and ends 6/13/2015 at 12:00 AM CST. This giveaway is open World Wide to anyone 18 and older that has a valid PayPal account. This giveaway is sponsored by Qmee and Living Frugal with Erika will be sending out prizes to the winners on behalf of Qmee. All entries will be verified and you must enter using the Raffle Copter form. Winners will have 48 hours to claim their prize or another winner will be selected. I am moving and saving up for a new mattress so I would apply this for that. I would put it toward groceries, they are so expensive. I would use it towards a xbox one game for my husband. I will use it to pay my credit card. I’m saving for the kids’ Christmas presents. I would use the cash on Father’s Day gifts!! I’d buy my sister a birthday present. If I won I’d use it for groceries. I would put it toward my wedding in September! I would put my cash into my stock account, every little bit helps! I would use it to go see a movie. With father’s day right around the corner, I will buy something nice for my Dad, maybe some art supplies as he is a talented painter. Thank you for the great giveaway. Happy Spring! Im saving for a camera! it would go towards that goal! On diapers or formula probably. I would use it to buy something for my new grandson, clothing and shoes. I would use the cash to save up and buy something really special for my friends! I’d use it to put toward birthday gifts for my son. I would use it to buy a new bathing suit and other summer clothes. I’d take my husband to lunch. I would use it to purchase some new sewing supplies! I would start back to school shopping for my kids. I would get a new swim suit! I would use it toward a stereo system. I will likely use it for gas. I’d use it to pick up some clothes for my kids– especially shoes for my oldest, that boy goes though shoes! I would use it to buy pans for my new apartment. I would take my husband to dinner. I would use it for summer activities. I would buy cat food for my 4 cats that I have. I think I’ll buy a really fancy cake! I would use the money to buy some groceries. Thank you for the giveaway. I’d treat my kids to a nice lunch. I would buy some new comfortable work shoes. I’d use it to buy some new shoes for my boys. Their feet grow so fast! I would use my cash on my utility bills. I will buy some new tops. I will use it to purchase a new beach bag & suntan lotion for this summer! I would use it toward a family fun day. A gas tank getaway ~anywhere but here ! If I win the giveaway I would put the cash towards buying gas! I’ll go out to dinner. It would go into my paypal account, available for use the next time I purchased online and paid via paypal. I would use the money to go out to dinner. I would buy Carter some new clothes for summer. He grew so fast over the winter! I would use the cash to pay for groceries. Thanks for the giveaway! If I won I would use the money to purchase some items my son needs for camp this summer. I will use it to take my husband out to dinner. I would use the cash for gardening supplies. I would use it to pay down a vet bill for my dog. I’m guessing either music from iTunes or books from Amazon. I would probably get books with this. If I won, I would buy a Keurig coffee maker. I would spend mine on cloth diapers. I am trying to build my stash before baby comes. Some summer fun with my kids. Maybe the movies or some special treat. I would use it toward new games on Big Fish. I’d use the cash toward airfare to surprise my sister with a visit for her birthday! I would use my cash for a couple new pairs of leggings.